Raven and her crew finally set sail for the high seas. There's quite the learning curve for everyone involved as the many crew members must now adapt at being in close quarters with one another. It's a learning curve for Raven as well as the leader, the captain, and pirate-in-charge to manage all these different personalities on the ship. 'Princeless: Raven the Pirate Princess' #5 is more about finding its sea legs than swashbuckling but that's what make this series unique and special. Jeremy Whitley takes his character development seriously. He wants you to know about each character and care about them probably in ways he does. This is character-driven storytelling first and foremost and with a combination of lengthy dialogues or brief scenes between shipmates, finding out who these women are is more important than action for the sake of action. Despite the lack of traditional seafaring action there's still plenty of conflict and drama aboard the ship. Jayla's antagonistic demeanor is especially disconcerting as she complains about Cid whom she doesn't know is deaf and can't hear her question but feels ignored by her. There's philosophical differences between the battle-ready Raven and the pacifist Ximena who won't raise arms against anyone. There's an unnamed pirate who's also a Muslim that has to explain to Ximena that she's not in fact being oppressed to wear a hijab by men on a ship full of women. It is her choice. There's many interactions like this but also light-hearted fun moments like a race to see who can climb the mast the fastest, Sunshine's seasickness, card games between shipmates, and the crew member who prefers to sunbathe and read. Whitley populates the ship with many different women with distinct personas to build this microcosm of a society on Raven's ship. She's still in charge but willing to compromise when her name-calling approach to getting her crew to work draws concern from Katie. There are more effective ways to motivate the crew Katie tells her and Raven agrees to make a rule against anyone name-calling. Rosy Higgins and Ted Brandt continue to provide a wonderfully realized setting with great expressive diverse characters and colors from a limited palette. The purples, magentas, browns, yellows, make up the 'Raven the Pirate Princess' world. It's easy to be drawn into the story with such an inviting and warm color scheme. 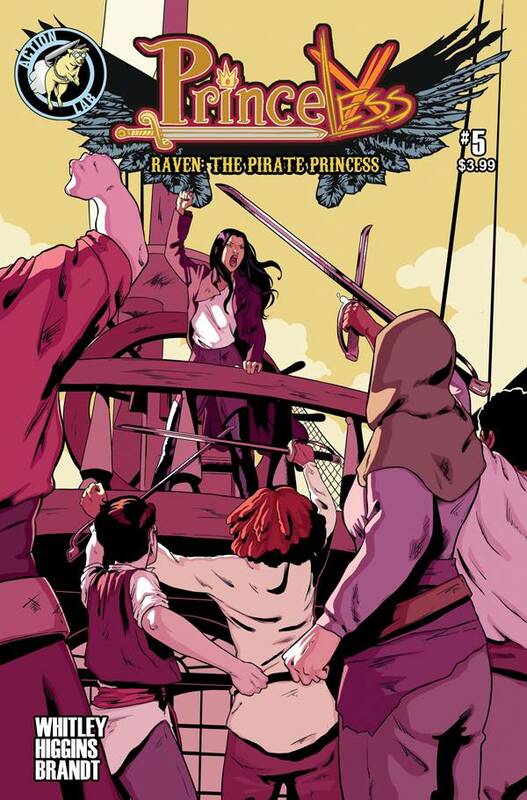 'Princeless: Raven the Pirate Princess' is about the characters, how they interact, who they are, how they treat each other and what their place is in the book. Where some writers skimp on character development, Whitley soaks in it, drawing every bit of personality and nuance from his leads. If you're looking for a lot of action at the expense of character then this isn't the book for you. If you're looking for a great story to get lost in with a diverse group of smart characters then 'Raven the Pirate Princess' is the one for you.